I’ve had a PeeWee bit in my bit box for several years. 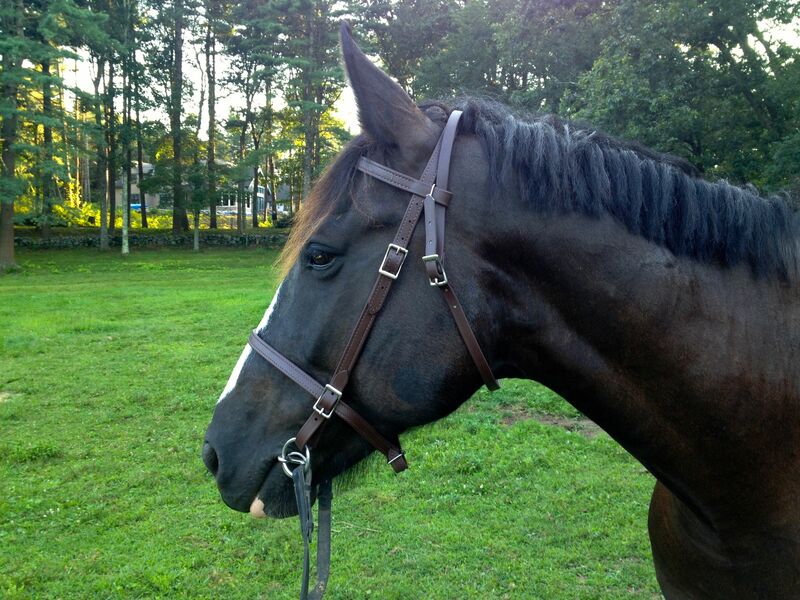 I originally bought it for Kroni, my Trakehner, because he had a thick tongue and a low palete. The PeeWee bit is good or horses like that because it’s a relatively thin curved mouthpiece sits neutrally in the mouth and with rein contact, it rotates upward — so there’s no pressure on the tongue. Many bits are just too large for their mouths and when the tongue lifts the mouth bar up it contacts the roof of the mouth bruises the palate. To escape the pressure, your horse may toss its head up and forward to create some room for the bit or open its mouth. The PeeWee bit worked pretty well for Kroni as far as bits go — although I eventually started riding him bitless. And then it sat unused until last year. When I first started riding Zelda, she kept getting her tongue over the double jointed snaffle. She was fussy and didn’t want to take a consistent contact. So I pulled out the PeeWee bit and presto, happy horse. Now I’ve read that some people think the bit is too harsh. Kind of like the Mikmar bit I use with Freedom, I think that what may irritate one horse feels good to another. And it all comes down to what your horse likes and if your hands are quiet. As I’ve mentioned before, different horses respond differently to the way a particular bit acts in their mouth. The PeeWee is designed to place pressure on the outside of the lower jaw, in addition to the tongue, lips, bars. Because the lower jaw is very sensitive, it reduces the amount of pull you need to make an impact. The external side bars sit against the lower jaw and push against the horse’s jaw when opposite rein pressure is applied. The strap underneath is not a curb chain and is intended to be loose; its purpose is to keep the side bars in the correct position. This position of contact on the tongue along with even pressure down onto the bars, encourages the horse to flex down at the pole, which means the horse is down over the bit in a better position to work rather than getting behind the bit and getting it’s head in the air and wanting to take off. 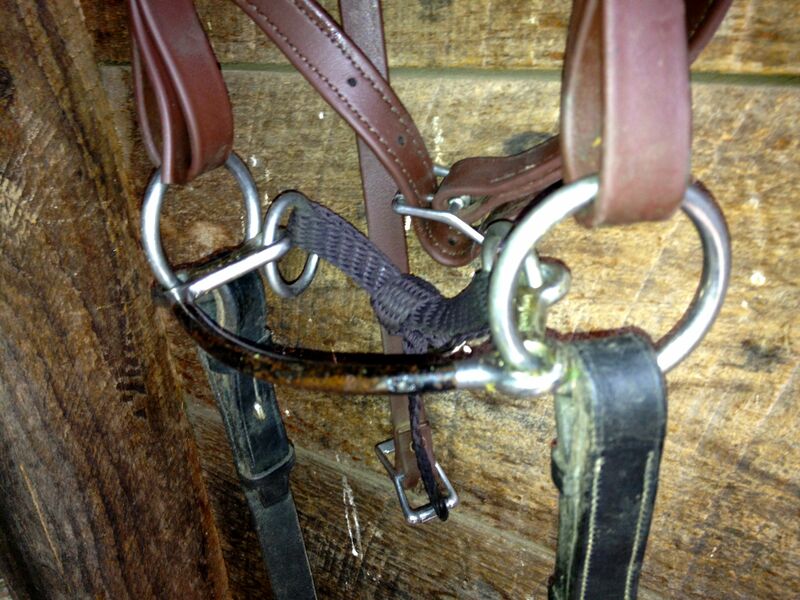 This better head and neck carriage position acts like a natural brake that makes it far easier to pull up a horse. The mouth bar also provides tongue relief and stays permanently quiet in the mouth until a command is given. This unique benefit is achieved due to the floating mouth bar. The mouth bar actually floats up and down and backwards on the large rings so at no time is there pressure on the tongue. Horses move their tongue readily when they swallow and while drinking water and with traditional bits a mouth bar is an obstruction but the mouth bar of the Pee Wee does not interfere with tongue movement, which provides comfort at all times for the horse. I’m not so sure about all of that except for the fact that Zelda is so quiet and responsive in the bit. It’s more than just the mullen mouth that she likes — I tried a Myler Triple Barrel Mullen last week out hunting and she pulled like a freight train and was constantly leaning on my hands. I put the PeeWee back in and she went right back to being light and was no longer fighting the bit. Curious to know if anyone else has tried it and whether it worked for you? If you’d like to try one, I have two and would be happy to let you try one. I have noticed you can buy them on eBay for about $25 now, too.